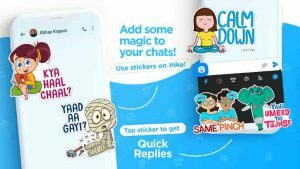 20,000+ Free Stickers – When words are not enough to express your feelings, say it with stickers! Make conversations more fun by using stickers. Stickers for every mood, let stickers do the talking. Largest collection of Indian regional stickers in over 40 regional languages available only on hike, express yourself better with stickers in your language! Privacy – Take charge of your privacy. Get complete control on who can see your last seen, profile picture, timeline and stories. Avoid the sneaky stalkers and nosy acquaintances. Hidden Mode – An awesome feature only on hike messenger, which allows you to hide your private chats from the messaging screen and access them easily with a password. Your private conversations are finally now protected & secure from anyone who takes your phone. Encryption – Communicate without any inhibitions on hike messenger. All your chats and calls are protected with 128-bit encryption. Awesome Group Chats – You can create group chats for up to 1,000 members, share large videos, original uncompressed images, documents of any type (DOC, .MP3, .ZIP etc). Polls – Can’t decide where to eat or which movie to watch with your group? Avoid lengthy discussions and make decisions easily by simply Voting. Chat Themes – What’s a romantic date without a candle-light dinner? Boring! Some things are best said in the right setting. Liven up your chats with the right theme. I’m really like it…nice Messenger ever..fast and safe secure style..a lot..nice guys give us more updates and improvements ! Hike is much better than all other social networking apps present. I have been using hike since 3 years without any problems till date. Its got amazing stickers and everything you could expect. Just a small suggestion i would like to give is that it should work in multi-tasking window as well. Light weight, clean, efficient and customisable. Refreshing themes and cool stickers. Miss the older Todo list/check list feature in groups though. Not receiving notifications. Whenever I open it then notifications appear. Reinstalled the 6.0 version. Missing the News & Daily Hike and other tips. Overall 70-30. Lots of sticker & Font styles. And most importantily the right swipe reply option is best. Congratulations to the team for this all new Hike 6.0. Let it stay minimal now. Please don’t add any unnecessary features again. It was a great decision to remove the “Explore” tab. A messaging app should be what it’s meant for. *Just a little addition* – “Make the app icon circular like it appears on playstore”. And it’s 2019, why still old emojis?